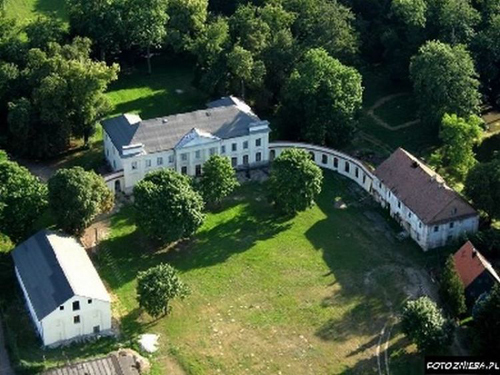 The Slubice Palace was built in 1789 for the mayor and chamberlain of Gostynin, Jozef Mikorski and his wife Krystyna (née Miaskowska) by the architect Hilary Szpilowski. 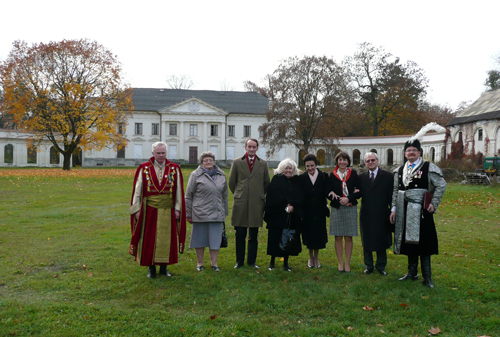 It remained in the hands of their son Jan Chryzostom Mikorski and grandson Roman. 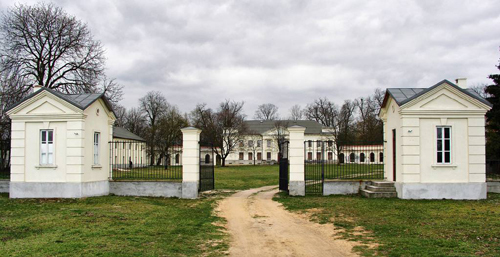 From the mid nineteenth century the estate passed through the hands of the Potocki, Skarzynski and Grzybowski families. During the Second World War it was occupied by the German invaders and was a centre for the Hitler Youth. After the War the buildings housed the police militia and then a school until the 1970s when it fell into decay. The house is currently in private hands and is being rebuilt. The plan is to use the palace for tourist purposes. The palace complex consists of the main building and two outbuildings connected by curved arcades. 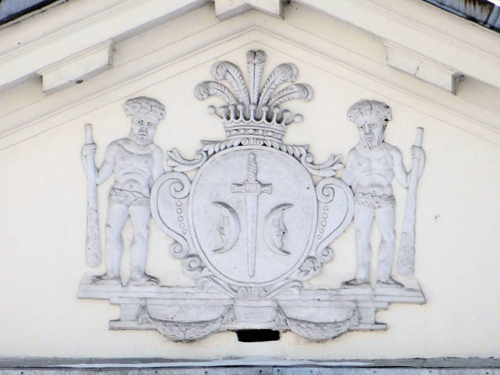 The tympanum in the pediment on the main façade displays the arms of the Mikorski family. There was a dining room in the right hand side of the palace and a ball room with a niche on the first floor. Some of the furnishings of the palace that once belonged to the Potocki family are now in the Wilanow Palace in Warsaw. 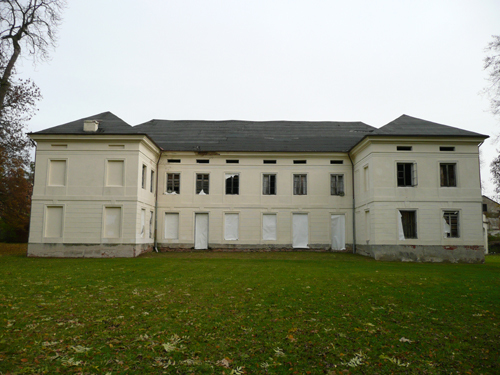 The left hand wing housed a kitchen and guest rooms, and the right hand one the stables and coach-house. The palace is surrounded by a scenic park with many old trees established by Jan Chryzostom Mikorski in the early nineteenth century and relaid in the English style in the early twentieth century. 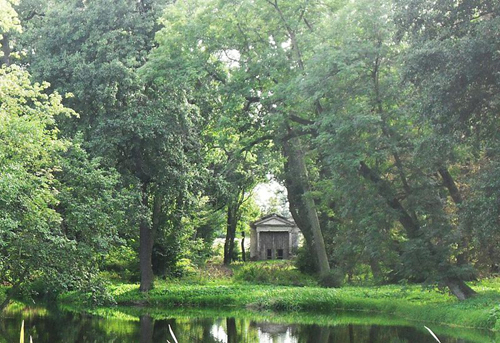 The gardens survived until the Second World War and included the following structures: an Egyptian temple; a Chinese gazebo and bridge on one of the three islands of the lake; an aviary and numerous garden sculpture of lions, sphinxes and vases. The best known of these was the Temple of Silence (Swiatynia Milczania) which was erected around 1820 by the architect Aleksander d’Alfonce de Saint Omer. While I was there during a recent visit I carried out an analysis of the paint in various areas.